Fourth Row Center: Film Writings by Jason Bailey: On DVD: "ESPN Films 30 for 30 Gift Set Collection, Volume 2"
On DVD: "ESPN Films 30 for 30 Gift Set Collection, Volume 2"
When ESPN’s documentary series 30 for 30 premiered in fall of 2009, the premise was irresistible: stories from the 30 years since ESPN’s inception, told by esteemed documentarians like Al Maysles, Hollywood big-shots like Barry Levinson, and rising talents like Brett Morgan. Critics raved; audiences slowly discovered and converged around the documentary films. The first fifteen titles were collected in last winter’s invaluable 30 for 30 Gift Set Collection, Volume 1; the rest of the collection is now assembled in Volume 2. That the series is now available in its entirety is the good news; the bad news is that the back half is altogether more uneven than its predecessor. To be sure, several of the latter films are tremendous, entirely up to the high standards of the series. Jonathan Hock’s The Best That Never Was (a rare two-hour installment) tells the riveting tale of Marcus Dupree, a stunningly talented high school football player whose bad luck, bad influences, and occasional bad decisions cut a very promising career short; his story is fascinating, but the film also serves as a pointed commentary on the politics of college and professional recruiting. 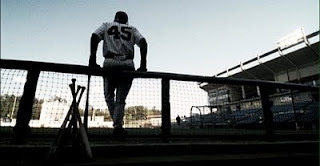 Jordan Rides the Bus, from sports-crazy director Ron Shelton (Bull Durham, White Men Can’t Jump), revisits the strange, oft-forgotten period of Michael Jordan’s first “retirement,” in which he left basketball and tried his hand at minor-league baseball. Shelton doesn’t stop at the sport or celebrity angles (though both are well-covered); he delves deeper, pushing into the complicated psychology of Jordan’s sudden career change. Into the Wind, Steve Nash and Ezra Holland’s profile of the late Terry Fox (the one-legged athlete who embarked on a run across Canada to raise money for cancer research), is enormously moving and powerful, particularly in its portrayal of the slow, steady build of its subject’s national fame. We’re prepared for the emotion of its conclusion, but it is gut-wrenching nonetheless. Reggie Rock Blythewood’s One Night in Vegasis an ingenious dual biography of Mike Tyson and Tupac Shakur, who became unlikely friends and whose lives intersected for the final time in September of 1996, when Shakur was murdered after Tyson’s bout with Bruce Seldon. Blythewood adopts a clever graphic-novel style for the outsized tale, and the result is invigorating and entertaining. And then there is The Two Escobars, previously released as a stand-alone title (reviewed here), which mates two classic documentary subjects—sport and crime—and gets every possible ounce of vigor out of them. This ambitious dual biography of Colombian footballer Andrés Escobar and Colombian drug lord Pablo Escobar is masterfully edited, full of tight, razor-sharp montage cutting and breakneck narrative; it just plain moves, knocking back and forth between the two men’s intersecting stories, from the lightness of power and fame to the darkness of disgrace and death. Those films are the highlights of the second set, and all are terrific—though, it must be noted, only The Best That Never Was approaches the quality of the best films in volume one (June 17th, 1994; No Crossover: The Trial of Allen Iverson, Guru of Go, Muhammad and Larry). Other films are worth recommending, with reservations. Thaddeus D. Matula’s Pony Excess, a warts-and-all look at the SMU Mustangs football program (and their notorious two-season “Death Penalty” shut-down for repeated recruiting and financial indescretions) is compelling viewing; however, it feels awfully close in subject matter to the earlier film The U, and suffers in comparison. Jeff Tremain’s The Birth of Big Air has some jaw-dropping footage (it profiles BMX superstar Mat Hoffman), but it is somewhat difficult to get all that worked up over the film when coming to it without much interest in the sport itself—a criticism that does not hold true for most of the series. Lisa Lax and Nancy Stern Winters’s Unmatched looks at the often-intertwined rivalry and friendship of tennis superstars Martina Navratilova and Chris Evert, who faced off an astonishing 80 times over the course of their career. Both women are geuninely charismatic, and the progression of their relationship over the years is fascinating. But the “conversations” between the two (done, for the most part, rather than conventional one-person interviews) are occasionally awkward and stagy, and—at risk of sounding sexist—the tone and style of the piece (soft-focus photography, “walking on the beach” shots, Natalie Merchant music) sometimes gives it an icky Lifetime channel “Intimate Portraits” vibe. House of Steinbrenner is a fine film, delving into the biography of George Steinbrenner and the history of Yankee Stadiums old and new with equal skill. But it is a pretty standard documentary for a filmmaker as skilled as Barbara Kopple (Oscar winner for Harlan County USA); considering her pedigree, we go into it wanting more than we get. In Marion Jones: Press Pause, filmmaker John Singleton (Boyz n the Hood, Higher Learning, and, um, 2 Fast 2 Furious) has a riveting story to tell—Jones, a gold medal-winning track star, was later outed for using performance-enhancing drugs and went to prison for lying about it—and he mostly tells it well. But he falls into the same trap that Peter Berg did in the series’ first film, King’s Ransom; he keeps insisting on putting himself on camera. Worst of all, he’s not very good on camera—his line readings are stiff and unconvincing. Same goes for poor Vlade Divac, who narrates (but neither writes nor directs) Once Brothers, the story of his rise with—and subsequent break from—Yugoslavian national teammate Dražen Petrović. There’s no need to pick on Divac, who is not speaking his native language here, but the words he’s been given are flaccid and cliché-ridden (“We had no idea how much our lives were about to change”). What’s more, the film will often cut from his narration to an interview with him, conducted by someone else (the film’s actual creator? ), calling the film’s narrative identity into question. The best sequences (like those concerning Petrović’s untimely death) are those that keep the narration away and just let the interview subjects speak for themselves. The clumsy handling doesn’t diminish the power of the film; it’s a big, important, international story (Croatian Petrović and Serbian Divac parted ways as their homelands did the same), and there are moments that are honestly moving, like his meeting with Petrović’s parents. You just wish the picture would have gotten out of its own way. Once Brothers is one of three films credited not to an individual director, but to an official organization; it is the product of NBA Entertainment, as Four Days in October is credited to Major League Baseball Productions and Tim Richmond: To The Limit is the work of NASCAR Media Group. ESPN’s motives for turning over these episodes to the sports industry’s media arms, rather than to the distinctive voices of specific filmmakers, are puzzling. The resulting films feel as though the rough corners have been sanded down, and have little to separate them from the countless documentaries those groups have churned out (competent though they may be). The profile of Richmond—a distinctively cosmopolitan figure in the good ol’ boy world of NASCAR who died of AIDS in 1989—certainly feels sanitized. MLB’s film, which looks at the Red Sox’s 2004 ALCS comeback against the Yankees, suffers from the fact that (unlike in the rest of the series) it’s telling a story that even non-sports fans are familiar with. But just when you begin to lose faith in the series, it bounces back. After that trifecta comes Cruz Angeles’s wonderful Fernando Nation, a thrilling recollection of the unlikely stardom of Fernando Valenzuela; Angeles manages to make an ‘80s nostalgia piece, an examination of media saturation, and a document of Latino pride, all at once and without seeming to stretch. He also beautifully captures the sheer joy of baseball, a feeling penetrated with appropriate nuance in Little Big Men, Al Symanski and Peter Franchella’s look at the 1982 Little League World Series and the unexpected upset of seemingly unstoppable Taiwan team by the American team out of Kirkland, Washington. That victory was featured (for five years) in the opening of ABC’s Wide Wold of Sports, and the team’s star, Cody Webster, became something of a national celebrity. But what kind of effect does sports stardom have on a 13-year-old boy? That’s the big question of the film—and one asked throughout the entire series, about each of its subjects. Some handle their celebrity well; others fold. New kids come up. The games go on. Glancing over this review, it would seem that the films in 30 for 30 Volume 2 are a good deal more flawed than they probably are; in nitpicking the problems, I may very well have glossed over their better qualities. But that’s the trouble with this series; the first fifteen films may have set an impossibly high bar for stories of sport told on a grand, epic, yet human scale. So let it be said that, even at their weakest, the films in this second collection are still first-rate filmmaking. And at their best, they are among the best documentaries in recent memory. "ESPN Films 30 for 30 Gift Set Collection, Volume 2" debuts today on DVD. For full A/V and bonus feature details, read this review on DVD Talk.